SKU: GG-5Y6T-GQT8. Categories: Antioxidant, Brain Support, Extracts, Immune Support, Longevity, Men's Health, Skin & Hair Support, Women's Health. Tags: anti bacterial, anti-cancer, Anti-inflammatory, Anti-viral, antimicrobial, antioxidant, autoimmunity, balanced immune system, betulin, Brain Fog, cancer, chronic diseases, chronic inflammation, cold, detox, digestion, fatty liver disease, flu, free radical damage, HBP, heart health, hepatoprotection, Herpes, high blood pressure, HIV, hypertension, immune booster, liver health, liver support, low immunity, memory, neuroprotection, pain relief, stroke, white birch. And now with 98% White Birch Betulin! No Matter How You Mix It! Really like this supplement powder! I add it to my coffee in the morning and it dissolves right in- no extra flavor can be detected. I do feel better when using this and it seems to give me a bit of extra energy to make it through the day. I am terribly caffeine sensitive- so my coffee is decaf- just love the flavor and this supplement does not give me the gitters or create anxiety like caffeine. It actually makes me feel better, more calm and focused. Highly recommended! I have been using Chaga in my morning and evening smoothies for about a month now. Before I started Chaga my cholesterol was high and my thyroid had been up and down for a couple of years. My last lab result showed that my cholesterol levels were normal range as well as my thyroid levels. Because, more than any other researched mushroom or fungus for health today, chaga is the most multi-faceted and precious of all. Looking much like both a black and golden nugget in its raw form, one could easily call chaga mushroom black gold. It is rich in powerful antioxidants and health-boosting compounds, making those who take it also rich in the treasure trove of benefits it bestows on wellness. Chaga mushroom aims at the very core of one’s well-being and vitality to holistically uplift and improve all sorts of symptoms, weaknesses, and struggles. In one powerful tonic supplement, chaga at once boosts immunity, protects the liver, reduces cancer risk, fights free radical damage, shields the brain and nerves, and improves focus, cognition, and memory. Over the long-term, it may help boost energy, lower one’s experiences with illnesses, and even provide invaluable support for chronic illnesses and diseases in addition to one’s doctor-approved treatment plan. Whether healthy and wanting to keep it that way, or facing unique health challenges, chaga mushroom provides protective support either way: keeping good health the way it is or lending extra strength to one’s arsenal and fight for maintaining wellness and vitality. Good health can be attainable—though good health with help from our Chaga Mushroom formula is accessible and right in one’s grasp. When was chaga very first used, and what was it used for? Records of chaga for healing appear among numerous cultures around the world, including China, Korea, and First Nations in Canada and the northern United States. It was also a botanical remedy favored by ancient peoples of Scandinavia, Eastern Europe, and Siberia as well. Today, visitors to these regions will still see it harvested, imbibed, and enjoyed as both food and medicine. Brewed much like coffee or tea, chaga was sipped as a tonic to protect the body and organs against all manner of chronic disease or weakness. It also had a pleasantly earthy, vanilla-like flavor. Whether as a healing beverage, hot broth, or prepared in a food soup or stock, chaga assisted with the recovery of any illness—from colds and flus all the way to certain cancers. Chaga preparations were either used in cases of specific diseases or taken every day in certain amounts as a nutritive booster to keep illnesses at bay. It may have even been used to detoxify the body in a way. Today, instead of taking the time it requires for making proper tea preparations (which can be a long process), chaga may be enjoyed in more convenient extract or supplement form. Plus, the benefits are just as good, if not even better when they are expertly extracted in supplement form, which ensures that all the healing compounds are represented in all of their richness. There are many kinds of mushrooms with stellar healing backgrounds and reputations. These include famous fungi like cordyceps, lion’s mane, maitake, reishi, and turkey tail. But none have quite reached chaga’s level of stunning health benefits. In fact, chaga’s mysterious, awe-inspiring properties have proven to be so fascinating throughout history that the fungus has drawn quite a bit of attention and interest in the world of research. Loads of studies and research have been undertaken on the mushroom to see what it can truly do. As it turns out, this has revealed some amazing discoveries. Studies show chaga is rich in a diverse rainbow of compounds, the most potent of all of them being antioxidants. Through these antioxidants mostly protect against free radicals and chronic inflammation, research also demonstrates further ability in this mushroom to protect the liver, soothe inflammation, increase immune powers, and reduce the risk of harrowing illnesses. Some of these chronic diseases even include autoimmune disorders (like rheumatoid arthritis), fatty liver disease, heart disease, type 2 diabetes, and digestive disorders. Chaga may also be helpful in healing the body against infiltrating toxins and harmful substances, such as from smoking or too many sugars or processed foods. Its effects on inflammation may even bring good news for depression. But not only that: chaga mushroom is proving to be a great source of antimicrobial and antiviral compounds, making it great support during times of colds, flus, and various digestive illnesses. How can a simple, unique mushroom be responsible for such an array of health benefits? The answer: it’s all in the compounds, but most specifically betulinic acid. This compound is perhaps the most sought-out, powerful compound in chaga. Fun fact: chaga grows on birch trees almost exclusively. To create betulinic acid (named after the genus Betula that includes all birch trees), chaga absorbs betulins from the tree that would otherwise be impossible to absorb and utilize in the human body, according to a study. Instead, chaga transforms betulins into the triterpene betulinic acid, which can be absorbed in the body, on the other hand. What’s more, betulinic acid is responsible for the mushroom’s most historic anti-cancer, anti-viral, antimicrobial, and anti-inflammatory qualities. Without chaga’s amazing transformative powers, betulin’s and betulinic acid’s healing gifts would be locked away in birch trees, forever unavailable to humans. Yet its synthesis into betulinic acid, which is found in chaga powders and extracts, makes benefits completely available to everyone. What’s most amazing about the venerable chaga mushroom: betulinic acid is not the only healing compound that gives it a healing edge. 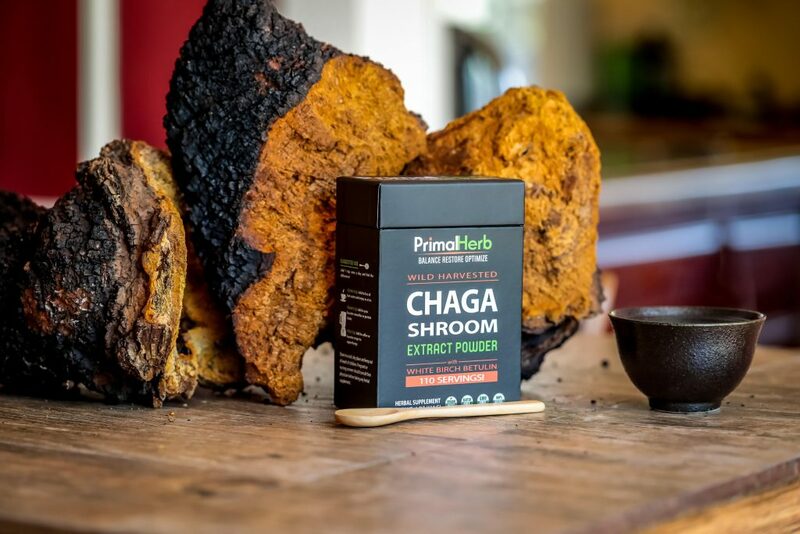 Like other healing mushrooms, chaga is full of polysaccharides, triterpenes, and many other healing compounds that make it one of the most well-rounded healers out there. According to research, polysaccharides in chaga account for further antioxidant activities that may reduce the risk of cancers, diabetes, and heart disease. They can also work as prebiotics (much like dietary fiber or resistant starches) to tone the gut according to a 2013 study, and boost immunity according to this 2011 trial. Beta glucans – especially beta D glucan – are the most notable polysaccharides found in chaga. Like betulinic acid, these also have some implications for helping fight against cancer, according to this 2013 review. Phytosterols are also found in the chaga mushroom. These provide some anti-cancer effects as well (according to a 2011 study). Meanwhile, polyphenols lend even more power to the mushroom’s antioxidant potential: its ability to reverse oxidative damage and protect against disease, inflammation, and hampered immunity. Terpenoids are also partially responsible for some of chaga’s anti-cancer qualities in this 2015 study. It might also be the vehicle behind some of its observed antiviral activity, captured in the data of this 2011 study. Taken all together, every single compound in chaga is useful to health. That’s right: a simple yet strange fungus from the north may hold more power than the average supplement, herb, or nutritious food. There are many different chaga supplements out there on the market today, each claiming to contain the powerful diversity that is chaga’s many healing compounds. However, research shows only combination or “dual” extracts— using both hot water and ethanol/alcohol— can provide ALL healing constituents for the most potent chaga product with all possible health benefits. That includes all polysaccharides, triterpenes, and especially betulinic acids. 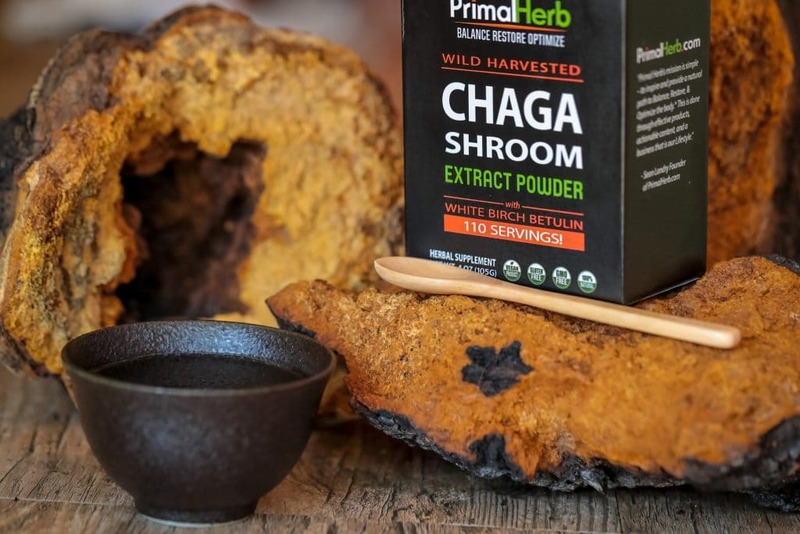 Within the chaga body itself, all compounds are tightly locked away within chitin, one of the toughest, most resilient natural materials found in all of nature. This is why it’s important to select supplements or extracts that are particularly double extracted: only dual extraction can unlock the compounds through this tough material. Extraction using both hot water AND alcohol is essential to getting the highest amount of polysaccharides, terpenoids, betulinic acids, and more possible. Any extracts of another sort simply won’t be the same, nor will they be worth the money or even effective at all. That’s why we’re adamant about providing customers with ONLY dual-extracted chaga fruiting body, which is then concentrated, filtered, and transformed into powdered form. This provides the very best levels of polysaccharides, beta glucans, and betulinic acids possible, which are the most important components to making chaga such a golden opportunity for health in the first place. Franziska Müllauer (2011). Betulinic Acid Induced Tumor Killing. Anticancer Drugs 21(3) 215-227. Chaga can be taken day or night – with or without food, so enjoy! Love this stuff. When I do take it, I simply mix it into a cup of hot coffee, it of course works in tea as well. I’m pretty happy with this product and it’s my third time buying this specific Chaga. Chaga mushroom powder.....little bamboo measure spoon was a nice surprise. 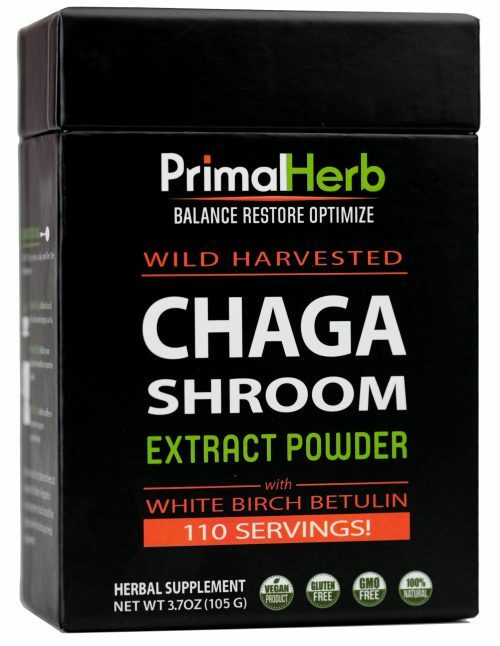 Chaga Mushroom extract powder- by Primal herb – nicely packaged – nice addition to coffee…. chaga-schmaga,,,,,lets drink it hoping it works !